Shared Portals, which includes Portal to Afghanistan, is a major initiative under Shared Studios, a multidisciplinary arts, design and technology collective focused on connecting people from diverse populations and carving wormholes throughout the world. 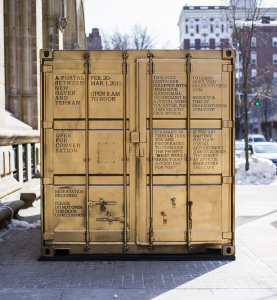 Inside the portals, which are modified from shipping containers and equipped with audio-visual technology, one comes face-to-face with someone in another container anywhere in the world. The two subjects then engage in a conversation as if in the same room. Since the launch of Shared Portals in December 2014, more than a thousand people in Iran and the United States have carried on private, 15-minute conversations with strangers from the other country. In the past few months, Shared Portals placed exhibits at Yale University and the Lu Magnus Art Gallery in New York City. This time, due to a new partnership with professors at the University of Herat, Shared Portals is bringing its real-time correspondence to Afghanistan for the first time. The Laboratory for Global Performance and Politics at Georgetown is hosting the Portal Project after reaching out to Bakshi expressing interest in collaboration. Lab Co-Founder and Co-Director Cynthia Schneider, distinguished professor in the practice of diplomacy, said that Georgetown thought the art installation would complement a larger initiative and performance by the Lab in partnership with the Georgetown Department of Performing Arts entitled “Generation (Wh)Y.” The “theatrical experience,” which will incorporate multimedia aspects, was created after Georgetown students experienced video interactions with students from Egypt, Syria, Afghanistan, Sudan, Pakistan, Saudi Arabia, Palestine, Qatar and Iraq, among other countries. According to the Department of Performing Arts’ website, the project will run April 17 and 18 in the Davis Performing Arts Center. Schneider said she believes that Georgetown’s portal is an invaluable chance to foster deeper cross-cultural understanding. Bakshi said he envisions that the use of technology could transform the way people communicate and shape their ideas of group identity. He also indicated that he chose shipping containers as a medium to unite participants in a common space with deep symbolism. Those participating in the exchange are expected to respond to the same prompt: “What would make today a good day for you?” Bakshi said the question encourages participants to speak about details of their daily lives and touch on the small things that make a long-lasting memory for them. After leaving the Portal, participants write about their experiences in a gold book, which are then published on the project’s website. Besides the 15 minute individual appointments, the Portal can also be used for off-hours reservations for longer stretches of time, enabling artists, students or academics to converse or collaborate. In the future, Bakshi anticipates the Portal to expand to more countries and more diverse populations. Potential future destinations include Iraq, Monrovia, Liberia and China. Shared Portals hopes to create a portal installation in a different location each month for the next six months. Joshua Ramjit (SFS ’15) volunteered at the Portal, but also engaged in a dialogue with an Afghan student. He said that the Portal directly shows the power that open dialogue can have in facilitating understanding across cultures. “Through the Portal, I gained a friend who reminds me that education, electricity and the economy are not things to take for granted,” Ramjit said.